Accidents can happen at any time! If one of your properties experiences an unexpected issue, like a car going thru a wall or a storefront window, fire or flooding, you can count on us to be there to make things right. A repair team will be dispatched quickly, to secure the premises. Our trucks are equipped and ready to roll 24 hours a day and skilled crews are always on call. With most incidents we will have your business operational within 24-48 Hours with repairs that match or surpass the existing structure. 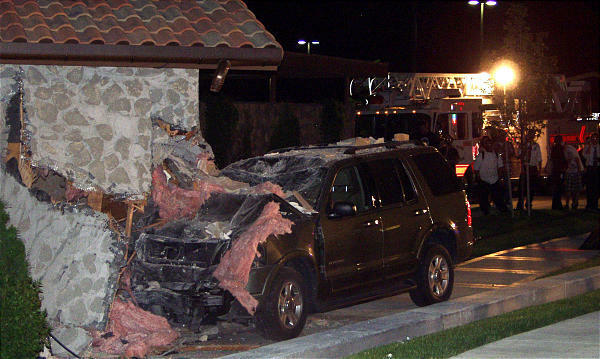 * Pictured above; photo of an accident which occurred at a restaurant in American Fork, UT. Craft Construction was notified on Thursday morning at 11am. By lunch the next day - the site was repaired, permitted, inspected & open for business.